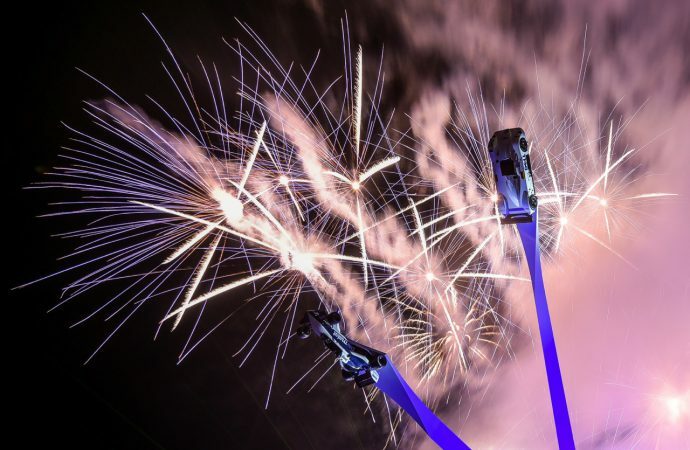 The latest of sculptor Gerry Judah’s stunning central features was unveiled Thursday night at the kickoff of the 2016 Goodwood Festival of Speed. The latest of sculptor Gerry Judah’s stunning central features was unveiled Thursday night at the kickoff of the 2016 Goodwood Festival of Speed. The soaring sculpture celebrates the centennial of BMW, the honored marque this year at the festival held at Lord March’s Goodwood House in West Sussex, England. “The magnificent floodlit sculpture swept up into a sky lit up with its own fireworks,” festival organizers said in their news release. 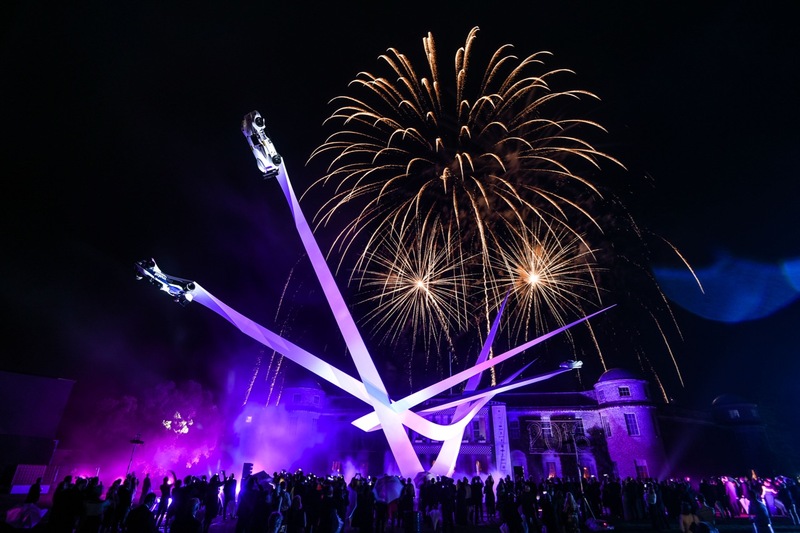 “Music, lasers in blues and golds, and ‘1916 – 2016’ illuminated in fireworks against Goodwood House accompanied the official reveal as a cavalcade of BMW’s finest cars swept up the famous Goodwood hill and the propellers of a Klemm Kl 35 spun lit with the BMW badge. Each division of BMW Group — cars, Mini, Rolls-Royce and motorcycles — will be celebrated during a weekend in which famous racers and race cars make their way up the hill and automakers from around the world showcase their latest and most exotic vehicles. BMWs heading up the 1.16-mile hill climb course include a 1957 507, the Mille Miglia-winning 1940 328 touring coupe, a 1965 1800 TI/SA, as well as 1966 R50 Kaczor, 1976 BR90S TT and a 1929 WR750 Kompressor motorcycles. Lord March officially opened the event by driving up the hill in a BMW 507. Judah’s central feature is his 20th such sculpture for the Festival of Speed. “Every year I like to think of something that is very different to anything we’ve done before,” Judah said. “Indeed, the hardest thing about designing these sculptures is trying to avoid any similarity, any conceptual connection, with anything I’ve done before.